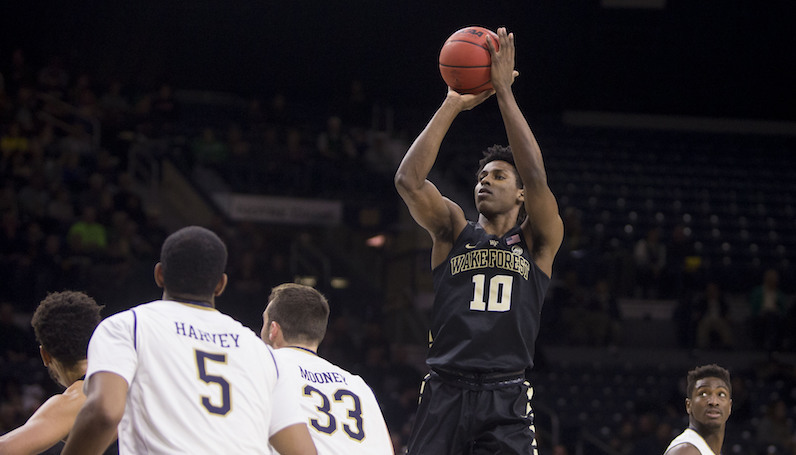 As was expected, Wake Forest freshman Jaylen Hoard has filled out the necessary paperwork and will test the 2019 NBA Draft waters. As Conor O’Neill notes, though, Hoard has yet to hire an agent — though that’s an entirely different world these days, too. The 6-foot-8 Hoard, a former 5-star prospect, posted decent counting stats this season: 13.1 points and 7.6 rebounds per game. A high-usage player (24.8 percent usage rate), Hoard lacked efficiency, though. Hoard shot just 22.6 percent on 3-pointers: 12-of- 53 3PA. Overall, he finished with an effective shooting rate under 48 percent, which isn’t great. In 936 minutes of action, Hoard recorded just 47 assists, which tracks out to just two assists per 40 minutes. Against top-50 opponents, Hoard’s assist rate shrank to a minuscule 7.9 percent. Also against top-50 competition (13 games): Hoard’s effective shooting rate dropped under 40 percent. Hoard played loose with the ball, too: 19.8 percent turnover rate (3.3 per 40 minutes). Despite his athletic gifts (and number of minutes), Hoard finished with just 14 dunks this season; although he did shoot 65 percent at the rim, overall.